Amerindian history and culture have long been subverted in the Caribbean, whether deliberately or not, but this new documentary by a first-time director is looking to redress the balance. Assing, who is a former contributing editor to Caribbean Beat, wrote and directed the 40-minute documentary. She also became its reluctant star when the decision was made, late in the production schedule, to focus the story on her. The film is all the more effective for taking the personal story to illustrate and evoke the larger one. Assing takes the viewer through her upbringing and into adulthood, all the time wrangling with the question of what it means to be a person of indigenous descent in today’s Trinidad & Tobago. “It really resonates with people because they feel they’re on the journey with me,” she says. The story centres on Arima, in east Trinidad, which owes its very existence to Spanish attempts to absorb and align the native population, an estimated 40,000 strong in 1592. The town was founded by Capuchin monks as a mission to convert the native population to Christianity. That remit was enlarged when, in the 1780s, Spanish Governor Don Jose Maria Chacon brought together all the converted Amerindians, first referred to as Indios and then as Caribs, from across the country to Arima. The town is still regarded as the nation’s seat of Amerindian culture and it supports the only organised indigenous community in Trinidad, the Santa Rosa Carib Community. 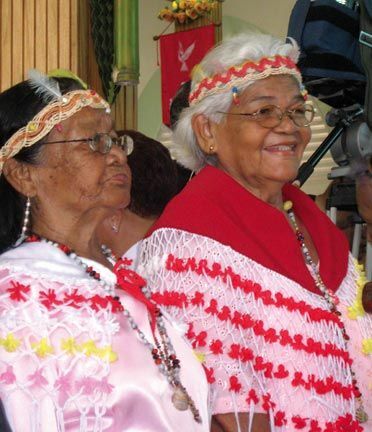 This community consists of around 400 people, identified on the basis of lineage and residence, and a Council of Elders headed by the Carib Queen, at present Assing’s great-aunt Valentina Medina, and the President/Chief, Ricardo Hernandez Bharath. Arima is also the site of the event with which most people now identify indigenous culture, the Santa Rosa Festival, in honour of the first native American saint. That event, held on the last weekend in August, is a Catholic one – a fact that Assing grappled with when she was growing up. What did it really mean to her as an Amerindian to be a good Catholic? Assing’s questioning nature and desire to understand are central to the film. For Assing there is more to being of indigenous descent than the Santa Rosa Festival. For her, the strength of her connection to the environment is the most powerful element. Brought up on the banks of the Arima River, she was first taken into the forest by her father, aged four, and a knowledge of, and respect for, the environment was instilled in her. This knowledge includes traditional herbal medicines, as depicted in the film through conversations with medicine man Christo Adonis. The relationship with her surroundings is a spiritual one. “I go to the forest and look for guidance and answers. Here I feel most connected with the universe and my family. We have family history that places us here very early on, but if it is that you want to claim this indigeneity, you have to take on the responsibility that comes with your connection to the land. Assing says the film has sparked numerous responses. “It has opened up questions and comments from people of all age groups. Topics range from the need for more local content on TV to sensitivity about global warming and care for the environment, to greater protection of our Northern Range, water conservation, the need for more research into the first Caribbean people, archaeological and anthropological – across the board. The story was always waiting to be told, but it was waiting for someone with sufficient passion to take up the challenge. Getting that story straight, or at the very least taking a more rigorous investigative approach to it, has real-life ramifications. “It’s your identity; it’s where you come from; it’s pride in who you are. “The film has been a journey of reconnection for me, but whilst my story is personal, my fight shouldn’t be a personal one. This is something that anyone who is interested in the history of this region should have an interest in,” says Assing. The history of the Amerindians is clearly not dead; indeed, it is alive in all those who carry that blood to this day. One such young woman is aiming to help set straight the misinformation and misunderstanding carried down through the ages. The Amerindians, launched at the 2010 Trinidad & Tobago Film Festival, is an important part of that process, but Assing sees it as the start of something rather than the end. Interwoven with the film is a potted history of the Amerindians in the islands: how they originated from the Amazonian and Orinoco deltas and how around eight tribes were known to have travelled up and down and inhabited the Caribbean chain from as long as 7,000 years ago. Traditionally, Caribbean children have been taught that there were just two tribes when Columbus arrived in 1498 – the peaceful Arawaks and the warlike Caribs – and that they were decimated by the Spanish invaders when permanent settlement began in 1592. This is the convenient history of colonialism: that the indigenous peoples were wiped out and that their culture barely affected what followed – ergo, history starts with Columbus. It is nonsense, of course, but has maintained its stubborn acceptance through a lack of rigorous research and an educational lethargy which have seen few challenging the established version. This is one of the principal reasons Assing embarked on the project, which took two years to complete.